The inputs should both have the type="text" attribute, while having names and id respectively "name" and "email". Also we can put the attribute placeholder, though it’s not obligatory. // Name and Email validation Function. This function gets the name and e-mail and if those are null strings puts out “Please fill all fields……!!!!! !” or if the e-mail does not match the regular email, puts out “Invalid email…..!!!!!!”. 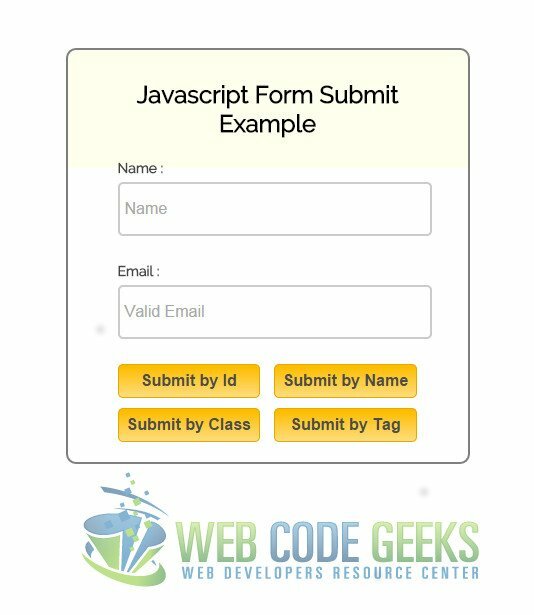 After getting the name and email values and passing them through validation, the function gets the element by tag name and submits them using the submit() function. After that, it puts out an alert saying the name and email entered, the form tag, and a message saying that the form was submitted successfully. Similar is what we’re going to do with the other three functions, except in them we’re going to get the elements by class, id, or name. And last but not least is styling the form. We have already styled the outer <div>s with the class="container" and class="main" attributes. Now we’re going to make everything else look as pretty.